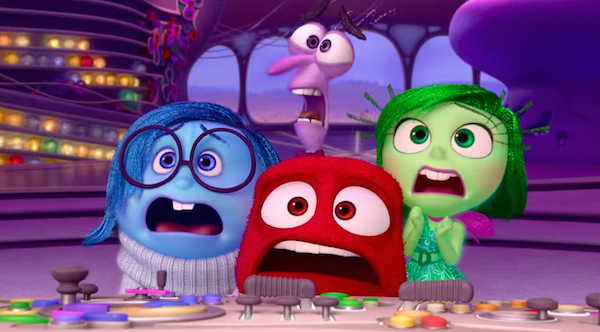 Inside Out proves that Randy Orton isn’t the only guy who hears voices in his head. Eleven-year old Riley is more than content with her family, life, and friends in Minnesota. As life would have it though, her father’s new job forces the family to move out west to San Francisco. Quite the change for a young adolescent. As such, her emotions, previously centered around Joy (Amy Poehler), make themselves more prominent. Riley begins to experience more Fear (Bill Hader), Disgust (Mindy Kaling), Anger (Lewis Black), and especially Sadness (Phyllis Smith). As much as Joy so desperately wants to make things happy again, all of the emotions have their own ideas as to help Riley through this transition. Emotions are cool to talk about, think about, and analyze. And yet, it kind of is surprising that they have never truly been featured in film. Obviously, we know when someone is unhappy, frightened, ecstatic, and enraged, but that is because they are thespians doing their jobs. To my knowledge, there has never been something that does what Inside Out does, which is actually take a look at these respective states of consciousness and how we function as a result of them. It doubles as both profound and rudimentary, but in both scenarios, it is as close to, if not perfect as one could likely want out of a film focused on highlighting emotions. 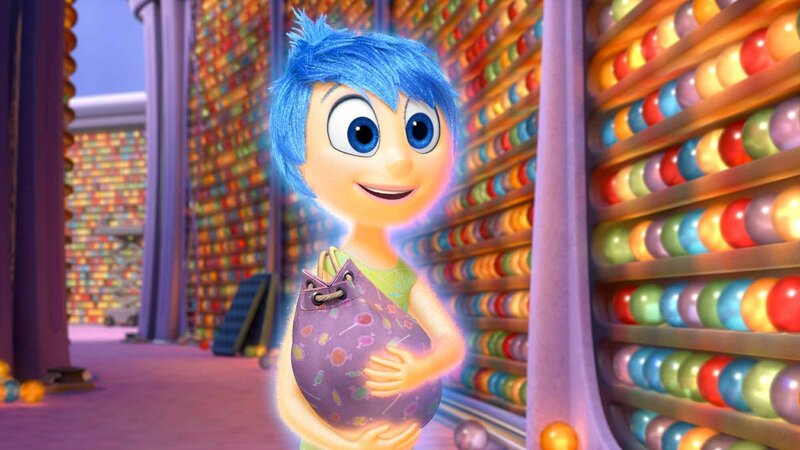 Speaking to the profound part, Inside Out still carries the second week TV spot and certain home media cover comment stating (paraphrasing) that “it’s fun for the whole family!” Rightfully so, but that doesn’t mean that one age group will not appreciate the thoughts and ideas more than another. With this, it may be easier for people who have lived to at least their teens years to get some of the wonderful complexities, thematic heaviness, and allusions. On the “lighter” end, simple jokes are interspersed, and both visually and technically, the color-scheme is a wonderful aid to distinguish the respective emotions. There is also a nice touch seamlessly done to show how an emotion is loaded more or less and how it comes out through Riley. This is a gorgeous animated feature co-directed by Pete Docter (Monsters Inc., Up) and Ronaldo Del Carmen. Not only directed by Docter and Del Carmen, they are credited with writing as well. The two have created a story where it isn’t so much the destination, but rather the journey that is so intriguing. Honestly, most will know how this generally will end. For what the film is hitting on in its message, it is a fitting resolution, just not anything unexpected. But, the voyage to get to there is where most of the fun is had, with the aforementioned allusions and ideas to concepts that PhD.’s probably struggled with during their studies. There is a real attention to detail found throughout the story. The same can be said for the voice-over work. As Joy, Amy Poehler is a choice without fault, as she almost always seems to be cheerful and positive in real life, just like her character. Lewis Black gets some great lines as Anger, Mindy Kaling is perfectly sassy as Disgust, and Bill Hader injects Fear with a constant anxiety. But for yours truly’s money, the real scene stealer is Sadness, voiced by Phyllis Smith. Phyllis, of The Office fame, always had some of the more underrated moments in the series as the motherly figure of the Scranton paper company. While she isn’t a big name, she is asked to do a lot here, from comedy to the more…sad and touching moments. You’ll want to give her a warm hug, and you’re soulless if you don’t feel that way. If all of this sounds like a very light take, that’s because it is. 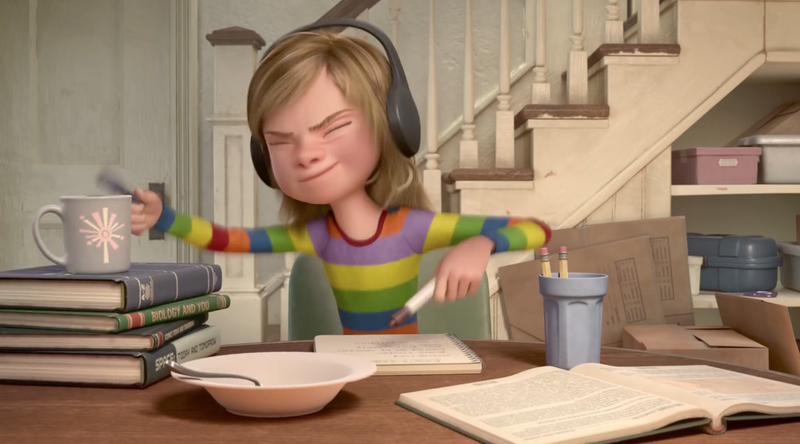 Inside Out is easily one of the best animated films done in recent years, and I honestly don’t know much more that can be said by myself that hasn’t already been mentioned in better detail by others in the cinema blogosphere. There’s a smart and authentic adventure that deserves to be left up to the viewer to experience, whether inside of the theater (preferably), or outside of it. Photo credits go to nola.com, pixarpest.com, and designtaxi.com. Real nice review, man. It appears this film really spoke to you. I’m leery about children’s movies but this one does sound different. I’m not even sure I’d call this a children’s movie, it is really mature. Try this one, there is a lot to it in my opinion. I appreciate the endorsement. My local theater is cluttered with kids on the street, streaming out of the theater, either for Jurassic or Inside. 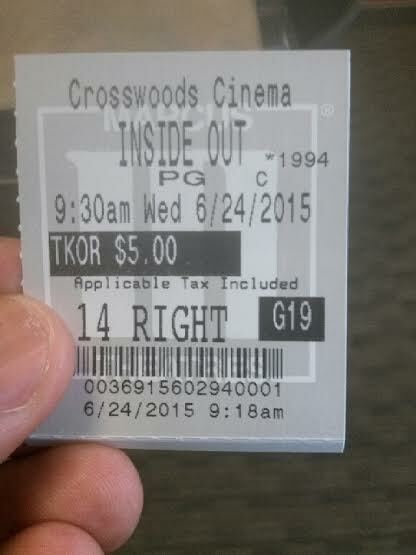 I need a midnight showing of Inside Out! Great review … I loved the film too, it really took me by surprise as I wasn’t expecting much! I am excited to see this again at some point. Really had me hooked from the start! I thought this was very sweet. I liked Sadness the best, but teh whole voice cast was superb. Phyllis Smith was amazing as Sadness, but yeah, everyone was so fitting as their voices. Interested in watching this again. Yay! Pixar is back! They’re always pretty good, but this is their best film since Toy Story 3. One of the best animated films I’ve seen, ever. I like your ambition! You saw this film at 9:30 in the morning?! Damn. Haha. But well worth it in my opinion, cuz this thing lived up to every bit of the hype. Such a great film, and one that happens to be an animated flick. I was able to come into the office a little later that day haha! I want to tell everyone about this one, it is that good. Amazing movie. The Bing Bong storyline was one of the most fun, yet heartbreaking, storylines I’ve seen in a film, and I loved all the voice work by the cast. Great review! Thanks Polarbears! I wasn’t sure about the Bing Bong character when it was first introduced, but yeah, that payoff was tremendous. All ages should view this one.